Unless you've been hiding under a rock, you've heard of FT8. This mode has been taking Amateur Radio by storm, cropping up on every band. It's being heavily used in the VHF+ contests and has even found it's way into the ARRL RTTY Roundup. Stations are using it to work DXCC entities, and some DXpeditions have been using the fox and hound mode heavily. It's everywhere! Depending on who you ask, this is either the death of the hobby or the renewal. The mode has some real issues. On bands like 6m, activity is clustered around a single frequency. When the band opens, there can be so many signals that they QRM each other and fail to actually make the QSOs. It's also slower than other modes, it seems that even large super stations have trouble working more than 30-40 QSOs per hour with it, though theoretically it could be faster. These are the same stations that can work well over 100/hr in SSB or CW. It's also limited in the data you can send, even with the free form messages. Some of these can be fixed by training. Some have to be fixed by the software itself. On the other hand, it lets a very small station effectively work during a time when the bands are pretty awful. Compromised antennas, low power, poor solar conditions, these are the facts of life many hams live with. More hams are living in condos or apartments. Young hams may be at home with parents who don't want large antennas up. HOAs abound. HF gear is expensive, and there are a number of less-expensive QRP options. More and more people are operating portable with a quick antenna from a field. None of these are conducive to making contacts on SSB. With FT8, it becomes very reasonable. It's my opinion that modes like FT8, and it's derivatives and the modes that will follow the path it is blazing, will save the hobby. It's getting more people on the air that couldn't before, and younger ones. Many young hams don't want to talk, and are very comfortable on the computer. More hams, and a younger crowd, and advancing technology, all of this leads to a healthy hobby. If they are excited about getting on the air, this is a positive! It is, however, causing a lot of turmoil. We are definitely losing older hams because of modes like FT8. This is a pretty big problem, older hams have a ton of experience and knowledge. The divide between older and younger hams makes it difficult to communicate between them, but there's a lot that any ham can learn from some of these veterans. I know of several hams that are struggling to stay on the air as the CW contacts dry up and it seems more likely that they'll be forced into using FT8 or similar modes. One common comment by younger hams, and even some older ones, is that these CW guys should just get with the times and move on. It's an easy sentiment to have. I don't necessarily agree with it though. I've long held the opinion that Amateur Radio is a collection of hobbies, rather than a single hobby. There are a million different things you can do with it, many not overlapping much at all. If someone's hobby is working CW DX on the HF bands, by telling them to give up and move to FT8 they are effectively being told that their hobby is no longer valid, and they should give up on their hobby and find a new one. If that's been their hobby for decades, you can see how that would make them feel. There is a lot of vitriol from both sides of the fence here. There is a revolution going on, and big changes are coming. The next generation of hams will look nothing like the hams that are in their later years. My hope is that the old guard holds on long enough for the new guard to be established, otherwise the hobby won't survive. We need to coexist - FT8 using apartment dwellers and legal-limit and a beam AMers. The anger is serving no purpose but to drive both sides away, killing our numbers. In a time where many of our bands are being threatened by industry, we need to stick together so that we have the power to defend "our" turf. That's my 2 cents, for whatever that's worth. Some years ago I came across the "Worked All Bands" Award, presented by the North East Weak Signal Group. The goal for the award is to make a QSO of at least 1km on every band available to US Amateurs. The description currently lists 26 bands, but I expect that it'll shortly be updated to include 2200m and 630m to give a total of 28 bands. For the curious - that is 2200m, 630m, 160m, 80m, 60m, 40m, 30m, 20m, 17m, 15m, 12m, 10m, 6m, 2m, 1.25m, 70cm, 33cm, 23cm, 13cm, 9cm, 6cm, 3cm (I forget the wavelengths after this point and we usually call them by frequency so...), 24GHz, 47GHz, 78GHz, 122GHz, 134GHz, 241GHz and Light. As of this writing, only Brian WA1ZMS has completed the award. When I initially came across the award, it seemed pretty unobtainable. Intimidating. In the intervening years, I became involved in VHF+ contesting. As part of the gear collected for the roving, I've accumulated bands up to 10GHz. Recent fortuitous purchases on eBay and discussions with other mmwave operators have given me bits and pieces to start building out a 78GHz transverter. I've also started building out light gear. What does this mean? I'm actually only a couple bands away from having gear to get WAB. Granted, they are the most difficult of any of the amateur bands to work. But I think that means that I'm officially starting to hunt that award. It'll take years to get the rest of the gear required, maybe 10 or more, but I'm on my way. This'll act as my official declaration to myself that I'm now workin towards WAB. I'm also going to try and work VUCC on the microwave bands while I'm at it. 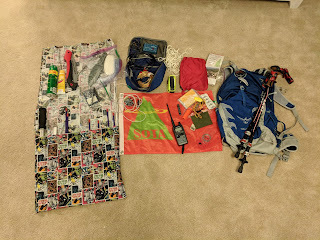 Inspired by a post on Facebook, I decided to do a rundown of what I carry with me on a SOTA activation. This tends to be a pretty personal list, different people carry wildly different things, but this works for me. In the warmer months, I run lighter. That pretty much covers it. I also will use a camelbak for water, a 100Oz one that fits in the pack. Sometimes I'll run a different HT, sometimes I'll have a hand mic with me. The arrow will sometimes stay home if I'm doing an HF activation. I've found the poles are a must, and I rely heavily on them to protect my knees. If my arms aren't sore when I'm done hiking, I'm using them wrong. I'm looking to replace the porta paddle with an integral touch keyer, it's just a project that I haven't completed yet. The saw may be a lot of excess weight, but it's nice to be able to clear large branches that are down on the trail. I wouldn't recommend using it unless the branch is blocking the path, but if the wood isn't cleared then hikers will start to go around. This causes the trails to widen, or other trails to form, and causes unnecessary damage. The MTR is a nice little radio. It'll run for an age on a standard 9VDC battery. It covers the 3 bands my antenna covers. I had a Yaesu FT-817ND, but after one hike schlepping it up a hill I had enough of the weight. It's a metric ton. I'll also carry a Shakespear Wonderpole if I'm expecting a rocky summit without trees to support the antenna. In the winter, the base kit stays much the same, I just add a lot more stuff. As you can see, a lot more stuff. The pack switches to a the Osprey Atmos 65. This is mostly because of the piles of clothing required on summit. Usually I'll hike in a light coat, warm pants, water proof over pants, and maybe a water proof shell jacket. On the summit, when I'm not moving for a while I need more clothing. Usually a fleece jacket or vest, heavy gloves, hat, maybe a face mask. This is all bulky and I need the space in the bag, so the larger bag it is. Continuing clockwise, we have a couple traction options. 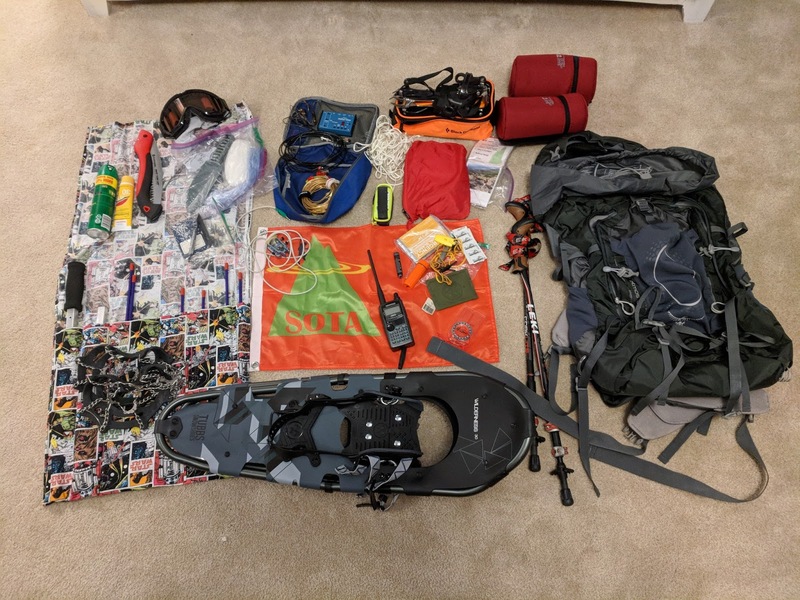 In New England, we can get a wild variety of conditions on the trail, so I generally won't carry all of these - pick what makes sense. The snowshoes are Tubbs Mountaineer, and also on top of the yagi bag are Kahtoola Microspikes. The 'spikes are always with me, and will get me through most of the hikes I'll do. I haven't carried the snowshoes on an activation yet, but if I know there's a good snow base on the trail they'll be coming. I just haven't had the opportunity recently. The goggles are Smith Knowledge OTG, useful for when it's blowing hard out. The orange bag is my Black Diamond Contact crampons. These are carried rarely up here, but we can get icing even on the lower summits that are pretty gnarly even with microspikes. The red pouches are insulated pouches for nalgene style bottles, in freezing temperatures they'll ensure I still have liquid water. I'll fill them with slightly warm water and place them cap down in the pouch (ice will freeze towards the bottom first, then). I also replace the baskets on my poles with snow baskets, usually I don't run with any baskets at all to prevent snags and leaf gathering. Not pictured are all of the assorted clothes that I wear - fleece lined track pants, heavy Darn Tough Mountaineer socks, assorted jackets and vests, and whatever else I feel conditions warrant. I also must point out the amazing Turtle Fur Fog Free face mask, which is the only thing I've found that keeps my face warm in the wind while not fogging up my glasses. I also carry a small first aid kit, which I just noticed isn't pictured. Hopefully this'll help someone decide what they should carry! I have one of the ID-51A Anniversary model HTs. It's a nice radio, fairly compact and built pretty well. It lacks direct keypad entry, but if I didn't use the APRS and full-duplex features on my TH-D72A the ID-51 would be my main HT. It still gets carried around for general use at least as much. One thing I discovered with it is that in DR mode, if you select "Link to Reflector" the radio only gives you the option to select REF reflectors. There is no built in method of connecting to the other styles, the DCS or XRF (DExtra) reflectors and similar. This appears to be a similar issue with the ID-4100 and ID-5100, and I presume the ID-31. A brief look around suggests that the IC-7100 and IC-9100 get around this by requiring the full input of the linking/unlinking commands - though the IC-7100 seems to expect the same method of entry for all commands that we can use on the ID-51 and others. I asked on the DSTAR Users group on Facebook and found a video that describes how to work around this limitation. The short story is, you enter DR mode and select your repeater (or hotspot). Click the center blue button on the To: field to bring up the SELECT menu, and the you choose the "Your Call Sign" option from that menu. You hit the quick menu button, and select "Add." Enter a descriptive name in the Name: field, and in the callsign field you enter the link command to link to the reflector. A reflector link command is the reflector ID followed by "L" - so if you're trying to link to XRF555A, in the Call Sign field you would put "XRF555AL" After you select this, hit the <<Add Write>> menu option to save it. Now whenever you want to link to that reflector, you can just go to To: -> Your Call Sign -> Reflector ID. It'll send the Link command and you'll be all set. This is much simpler than trying to program in a pile of different memories to do this for you, and you can enter new reflectors on the fly without requiring a PC.